We left our summer home in the Mt Hood National Forrest the first week in September. I had been asked to get to the Sugar Beet Harvest as soon as we could so I could get settled in to my new Night Shift Foreman position at the Hillsboro, ND, beet piling yard. We thought we would have a few weeks to get from Oregon to North Dakota, but that quickly changed to ASAP. We had to cut our adventures short to get there in a timely fashion, but we still had time to do plenty of exploration on our way East. 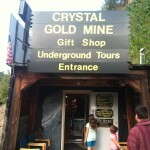 Driving across Idaho, we came upon a newer roadside attraction, The Crystal Gold Mine, and were very glad we stopped. 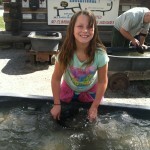 It is just off of I-90 in Kellogg, Idaho, and well worth your time. They have plenty of parking for big rigs like ours, so don’t be worried about parking space. 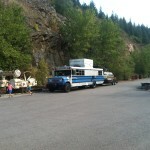 They also offer a campground, but we didn’t have time to stay with Glacier on our minds. We had no idea what to expect when we stopped, we just noticed the sign that said they offered underground mine tours and decided to see what it was all about. The mine was actively mined in the 1880’s, but had been sealed off and lost in the mountain until it was rediscovered in 1991. Left untouched by human hands for that long, it had begun to develop as a cave would over the centuries with new crystal formations growing for over 100 years. 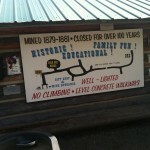 It was decided it would be a great educational mine, and it does not disappoint. 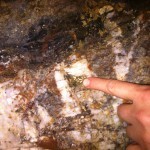 You can even touch some large gold nuggets that are still embedded in the walls of the mine. 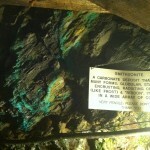 It is amazing to walk down under a mountain, knowing the miners used candle light to do their work. 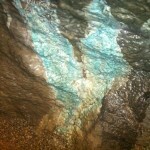 The methods they used to create the mine allows it to not require supporting of any kind, they followed the quartz seam as it dropped through the mountain. It is believed that they sealed the mine and left its location secret so they could come back with more equipment or workers. For some reason that is lost to history, they never returned. 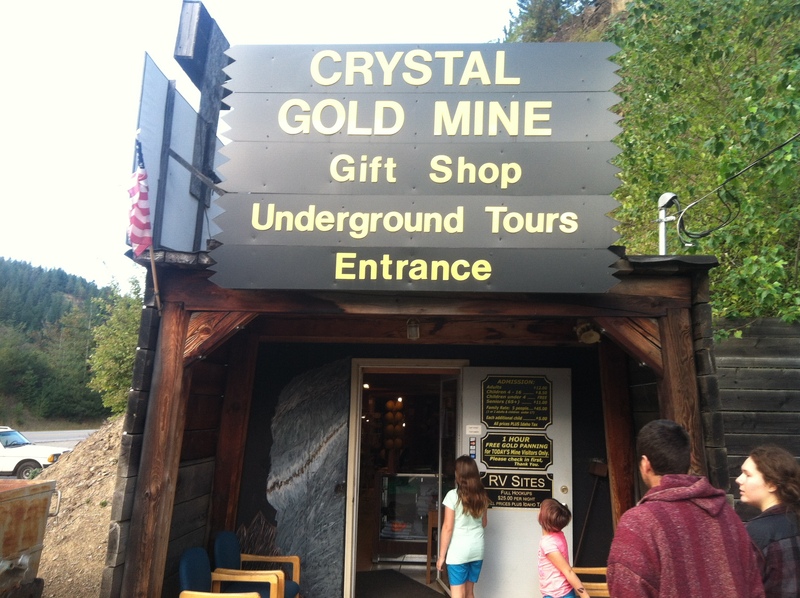 The mine still has very rich gold deposits, but the new owner could see the benefit of using it as an educational mine for generations to come. 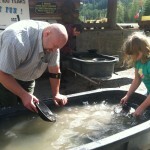 After the underground tour, we did a little gold panning to see what we could find. The girls had fun splashing in the water, but they still had panning experience from our time in California in the American River. It wasn’t as intriguing for them as it might be for kids that have not done it before. 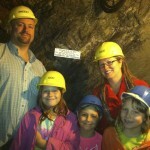 We were at the mine for a couple of hours, then it was time to get back on the road. Our sights were set on Glacier National Park by the next day so we had some miles to put behind us. The bus was slow going over some of the mountain passes (14 mph at one point for several miles) but we made it. We even saw a Moose on our way to Glacier that evening. 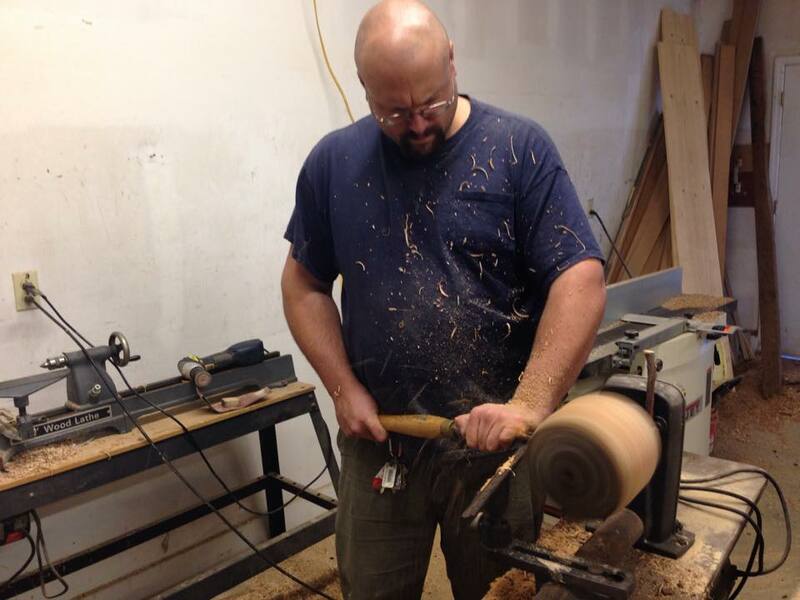 This entry was posted in Education, Family Fun, On The Road Again, Tours on April 19, 2014 by Jody.